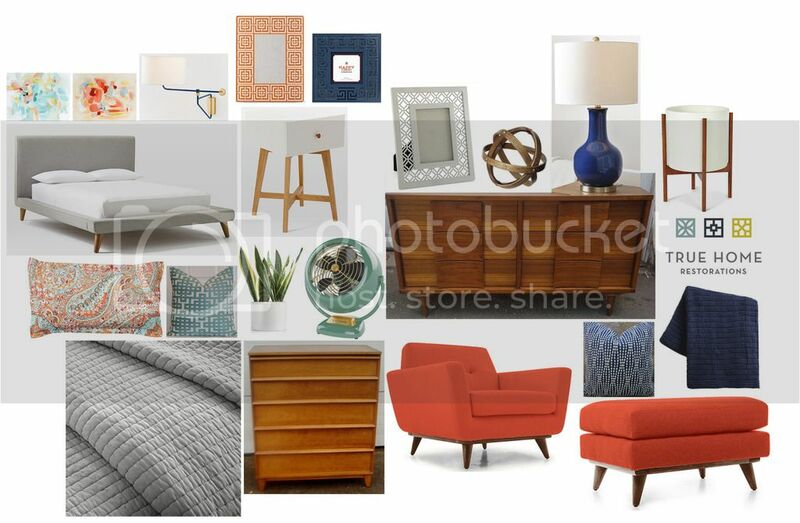 This may be my favorite master bedroom refresh I've done! The client had most of the gorgeous furniture (including the gray upholstered bed) to work with, and had just invested in the modern, white nightstands and navy & brass lighting, so it was really all about bringing some accessories into the room and pulling all the details together with them. They didn't want to go too graphic or modern, so I kept the bed simple with a textured gray coverlet and added in some color with a great patterned sham and one throw pillow to keep making the bed simple, yet visually interesting. With the larger size of the room, you know I couldn't resist a bold midcentury chair & ottoman to take up some visual space. Add a graphic pillow and throw to curl up on, and you've got a cozy little reading nook. Some of my favorite photo frames from Jonathan Adler's Happy Chic line are a great place for family photos, which I personally prefer to tuck away in private spaces of the home. All the colorful little details make the vintage wood dressers shine, instead of just a place to throw laundry and old magazines that seem to accumulate quickly in my own room. Love how this design turned out - I plan to share real images later in 2016!